fitdistr takes two arguments, a list L of presumably independent and identically distributed samples and a distribution type, which may be normal, exponential, Poisson, geometric, gamma, beta, Cauchy or Weibull. The type is specified as normal (normald), exp (exponential or exponentiald), poisson, geometric, gammad, betad, cauchy (cauchyd) or weibull (weibulld), respectively. The command returns the distribution of the specified type with parameters that fit the given samples most closely according to the method of maximum likelihood. The Kolmogorov-Smirnov test indicates that the samples from S are drawn from Z with high probability. 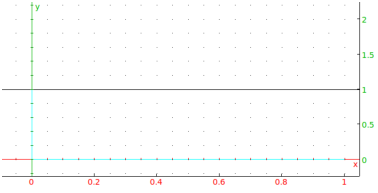 The mean of Y is about 5.05 and the variance is about 2.04. Now the variable Z=exp(Y) has the sought lognormal distribution.